Female United States Marine Corps recruits receive instructions for a training exercise during boot camp March 8, 2007 at Parris Island, South Carolina. 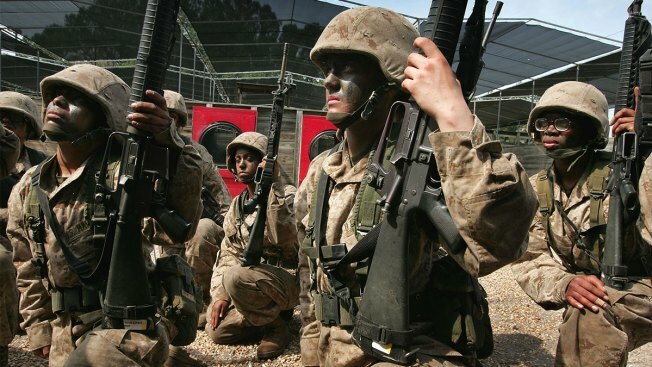 For the first time in U.S. Marine Corps history, women will be training alongside men during boot camp, NBC News reported. A platoon of about 50 female recruits began training Friday at a boot camp with five male platoons in what is traditionally an all-male battalion at the corps' facility at Parris Island, South Carolina, according to a statement. The integration of women and men at boot camp is "a first in the history of Marine Corps recruit training," the corps said.